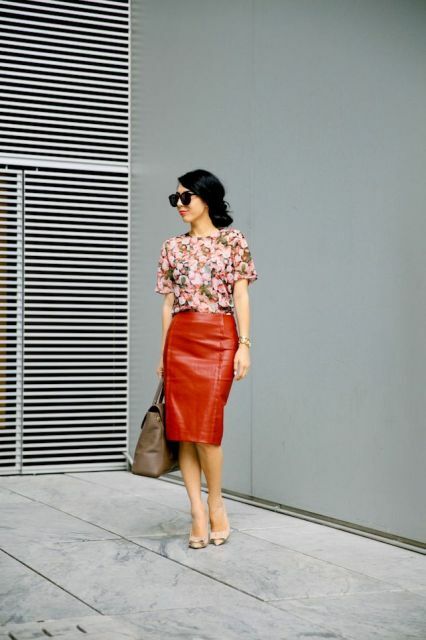 We continue to share with you fabulous pencil skirt outfit ideas for these spring and summer days. And today let’s consider some looks with gorgeous leather ones. This type of skirts will be perfect for office styled (if you don’t have a strict dress code, of course), casual and party looks. All you need is to combine it with airy lace or satin blouses for creating an elegant and chic outfit or mix it with loose sweatshirts and oversized blazers (or even leather jackets) to make a rock’n’roll look. You can choose any color for your new item, but you should pay an attention to black, brown, red, marsala or emerald ones. Now you can scroll down to see all kinds of these skirts. If you want to make a graceful look, we have some ideas. First of all, you can take a pale pink loose blouse and combine it with black leather pencil midi skirt, a two colored small bag and beige pumps. Secondly, if you are a big fan of total black outfits, you can choose a black sleeveless top and mix it with a black skirt and classic black pumps. 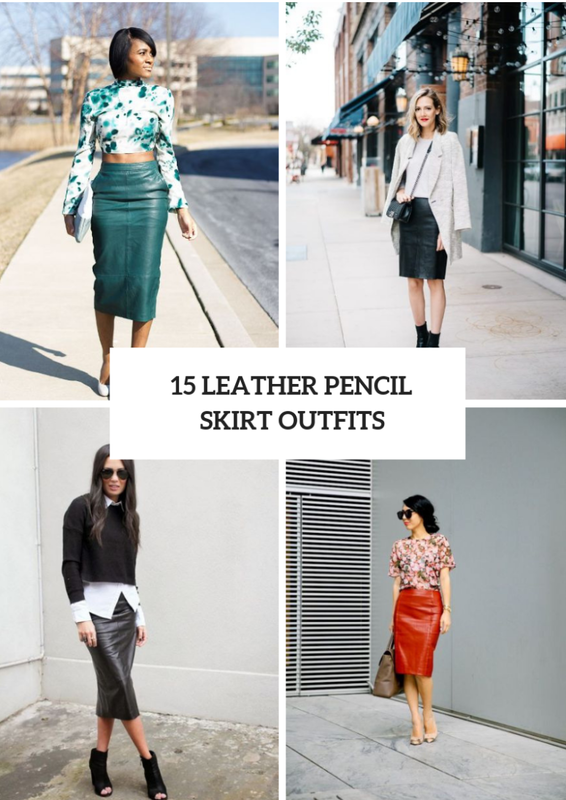 And, thirdly, you can take a watercolored crop shirt and pair it with an emerald leather high-waisted pencil skirt, a white clutch and white pumps. For those who want to look more fashionable, I offer to try to combine a blue, black and white loose sweater, a black patent leather pencil skirt, oversized sunglasses and black ankle boots. Wanna something eye-catching? Then try to get a studded pencil skirt and combine it with a black blouse, a black blazer and silver ankle strap shoes. Or take a hot pink jacket and mix it with a striped shirt, a black knee-length skirt and black high heels.